For those who do not know what a Sprint Car (Sprintcar for us southern hemisphere folk) is, it is a purpose built, single seat, front engine race car designed to race on dirt oval tracks. These cars can be winged or wingless with the wings being quite different to other types of aerodynamic devices as fitted to race cars as the main wing is fitted with large vertical side panels. These help to push the car down when it is sliding sideways. They also have a secondary safety feature in that they absorb a lot of impact energy when these cars get upside down, a not uncommon occurrence! And they are just the thing to put large sponsorship sign writing on too. 410 c.i. motors are the norm now pumping out around 850 horsepower with top speeds around 140 mph on the larger tracks such as Knoxville, Illinois where the biggest meeting of the year is held, the Knoxville Nationals. With an excess of power these cars regularly pull their front wheels of the ground under full acceleration, even when sideways. It is indeed an incredible sight seeing 24 of these pouring down to the start line for a Feature race. These types of racers are very popular in the USA, Australia, New Zealand, Canada and are making headway in the UK. The biggest series is undoubtedly the World of Outlaws (WoO) which tours many parts of the US and for the last 4 years has also held a round in Australia at Parramatta in the western suburbs of Sydney. A similar series is held in Australia and is known as World Series Sprintcars. Steve ‘The King’ Kinser is a living legend of the ‘Things with Wings’ and has won 20 WoO Championships, 12 Knoxville Nationals and over 500 Feature races. He has also competed in NASCAR, IROC (International Race Of Champions) and finished a creditable 14th in the 1997 Indianapolis 500. He was inducted into the Sprint Car Hall of Fame in 2005. This kit was originally released in the late 1980s by Monogram, with the main wing centrepiece still having copyright Monogram molded on it. This boxing was released in 1998 by Revell-Monogram. It comes in a hinged top opening box. 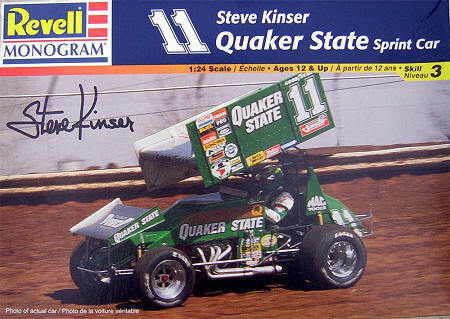 On the top this has a photo of Kinser’s car from some time in the ’97 season and an image of a track surface printed on the bottom, which can be cut out to use on a display base. Parts are molded in white plastic, chrome plated and black vinyl and total 96. The white parts are in a single plastic bag with the chrome and vinyl packed loose in the box. 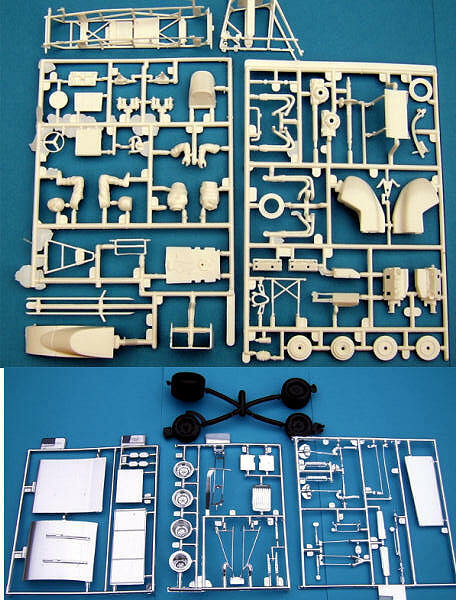 Molding defects on the white plastic parts include some flash between parts and their sprue and ejector pin marks on the inside of parts such as the engine cover, there are also seam lines that will need removing. The chrome plated parts on the other hand have blemishes and rough areas on highly visible locations such as the wing end plates, builders will most probably remove the plating from most parts, I know I will. Construction begins with the cockpit steering assembly and moves through the tube frame onto a well-detailed engine, multi part suspension, body panels, wing fittings and wheels. This is very well detailed kit and there is very little missing, allowing you to build a great Sprint Car OOTB, you even get an 8 part driver figure. The tyres have the correct dirt track pattern. Having said that, it should also be said that this is a model of a Gambler chassis, not a Maxim as driven by Kinser in ’97, it would appear that no changes have been made to the parts since the late ‘80s. Comparing the parts to the box top shows up a number of differences, most obviously the engine cover and the side bar work. Close checking of references is advised for those wishing to use this kit to represent the King’s mount from ’97. 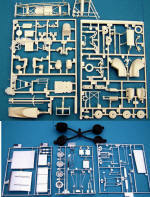 A number of after market companies produce parts to update the Monogram kits. 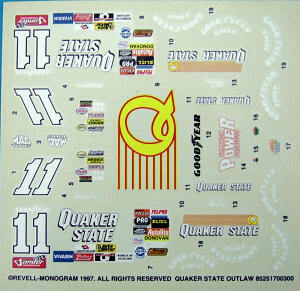 The decal sheet is gloss printed and most items appear in good register. Comparing the decals to the box top shows a number of differences in the smaller sponsor markings, however it is quite normal for these to vary between meetings within a season. In conclusion this is a kit with great promise and possibilities and the molding is a great example of Monogram at their best.